ronski you going to keep vdsl or ditch plusnet? 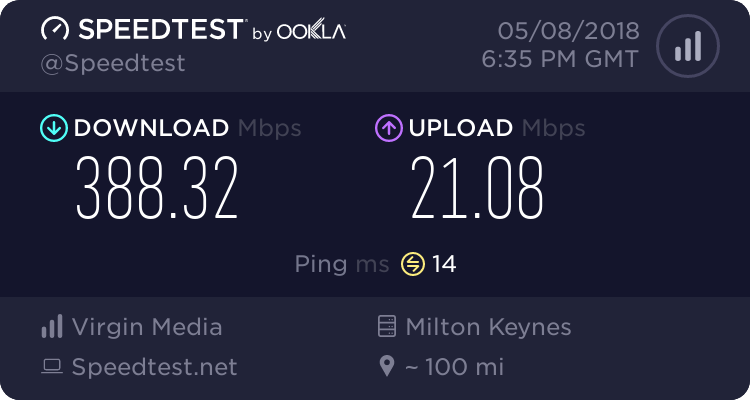 Very temped to ditch VDSL, but I am apprehensive of VM reputation, and currently their lousy upload speeds (hopefully they'll bump this up) which are not much better than what I have unless I go for a more expensive package which I don't want to. I'm sure some EPON magic will resolve the upload speed concerns though in the interim the more expensive package is the only option. VM aren't fans of TalkTalk's approach, not least because TalkTalk don't make money on it, and aren't Sky so can't massively subsidise broadband with TV revenues. I'm not a fan of TalkTalk full stop. That I did to-day it's Virgin Fibre Optics talked to the guys that were laying down this thin green tube you call a fibre duct it looked like a core diameter of 5mm, most of Bangor N.I has had gone though the same procedure they say it takes a month after laying the duct to then become live.
. . . it looked like a core diameter of 5mm, . . .
That will probably be the tubing through which the fibre itself is pushed, whilst floating within a stream of air. The kitizen best "qualified" to answer your queries would be Walter. He has spent many hours in the company of the BT technicians (and the various contractors) whilst the FTTC cabinets were being connected in the Guildford and Surrey Hills areas. There's really not much to see. They'll use a fibre blowing machine, nothing arcane about it. Contrary to popular opinion it's all rather routine and simple. The tricky bit is getting the ducts into the ground, sending the fibre down them is trivial. Tons of videos of fibre being blown can be found on You Tube. If you're curious about VM's network build more details here - https://keepup.virginmedia.com/Content/networkExpansion/doc/New_Build_Developers_Guide.pdf - going by that what goes to homes is a simple 6 mm diameter blown fibre micro tube carried inside a 54 mm duct connected to a termination box. I guess one of the things which interests me is how they get the fibre across one's property and into the house. Our house for example has an all concrete/crazy paving front garden and no driveway, also ground level in the garden is some 3-4 feet above pavement level and and when I dig in the odd flower bed I find only about 18 inches of soil before hitting solid chalk. This also means that any road works within a hundred yards or so vibrate the downstairs floor (which is solid not suspended. They'll run it along a wall or fence above ground most likely. They aren't going to be too desperate to shift a load of flags, dig underneath, then replace them. That makes the install a tad too expensive. That all sounds a bit shoddy, most of our estate has open plan front gardens, although some have walls/fences. I suppose the majority have gardens so easy to dig a small channel to bury the cable in, but there will be many with obstacles. The problem here is that our house and garden ground level is so far above the footpath level and its not a slope but a vertical stone wall, also there is a concrete path all round the hose so there is no way to get anything underground easily. We have concrete steps up a narrow path into the garden but again no easy way under it and they would have to avoid the water and drainage service which run under the path/steps. So I guess it will be problematic and along the side wall is the best bet, but they still have to cross the side passage somehow. Hello everyone, first time poster but serial lurker! I'm in Margate between WWX and the Hornby and have had terrible broadband all the time I've lived here. The problem is aluminium cable in the road, I gave up months ago trying to get it swapped for copper! I pay for 80/20 business fibre and get 11/0.5 at best! Anyway, I have worked for Openreach both as an engineer and as an Operations Manager and also for a contracting company installing for Virgin Media (NOTE, this was just before they took over the network, in those days it was NTL). I was running a gang of 3 guys getting cable in from the T outside and doing the internal fits. Anyway, regarding one of the earlier posts about cabling from the street into the premises, if it's anything at all like it used to be, it will be push, push, push by VM to get everything in as quick as possible. When I was on the tools for them, we sometimes had up to 8 jobs a day and were threatened with the sack if they weren't all completed, so we used to join up with other crews and help each other out. In the end, we turned up for work one morning and the company went into liquidation and everyone lost their jobs. So hopefully quality control is there and the schedule is within reason!